Please note that the content of this book primarily consists of articles available from Wikipedia or other free sources online. 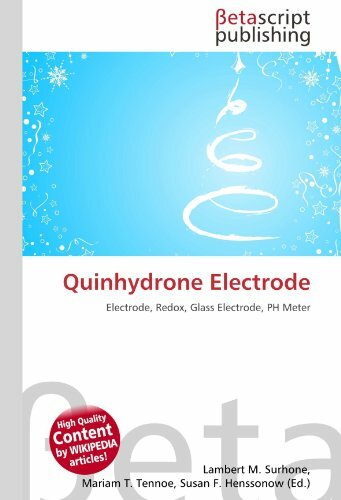 The quinhydrone electrode is a type of redox electrode which can be used to measure the hydrogen ion concentration (pH) of a solution in a chemical experiment. It provides an alternative to the commonly used glass electrode in a pH meter. The electrode consists of an inert metal electrode (usually a platinum wire) in contact with quinhydrone crystals and a water-based solution. Quinhydrone is slightly soluble in water, dissolving to form a mixture of two substances, quinone and hydroquinone, with the two substances present at equal concentration. Each one of the two substances can easily be oxidised or reduced to the other.